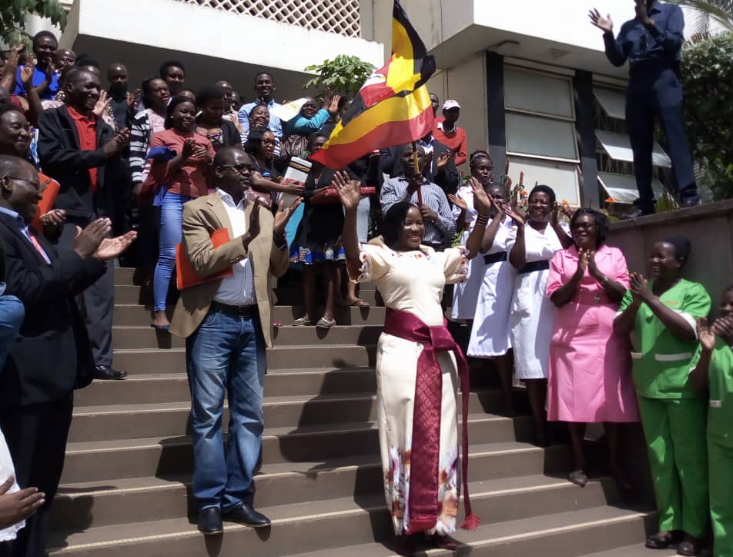 KAMPALA- Ms Jennifer Musisi, who has spent over seven years at the helm of the City served as executive director, Friday handed over office to Kampala Minister, Ms Beti Kamya. The handover ceremony took place at City Hall in Kampala. Musisi who announced her exit on October 15, 2018′ and submitted her resignation letter to the President, indicating she would vacate office on December 15 has through her twitter handle Friday evening expressed her feeling for successfully executing her duties. “When given an opportunity to make a difference, let your existence matter by leaving things better than you found them,” reads Musisi’s post. Musisi says that as KCCA ED, she has managed to fulfill her commitment and to deliver the services that Ugandans had for so long yearned for. “During my short speech, I committed myself to work hard to build an institution that would focus on addressing the challenges Kampala faced and deliver the services that Ugandans had for so long yearned for”. 7 years and 8 months ago, I walked into City Hall for the very first time to be introduced to the Public as the First Executive Director of Kampala City. During my short speech, I committed myself to work hard to build an institution that would focus on addressing the challenges Kampala faced and deliver the services that Ugandans had for so long yearned for. I also committed that we would work to build, an institution that Ugandans would be proud of. As I hand back the office and the City of Kampala today, I would like to say that I’ve done my absolute best to fulfil the commitment I made to the people of UG when I took up Office. We have made great effort to achieve progress in many areas for the benefit of the people and communities of Kampala through the numerous KCCA projects and programmes. We also worked to establish & build an award-winning City Administration, with sound systems and a committed professional team. Furthermore, we’ve strived to add value in many areas including sports, health care, education, social services, infrastructure & improved livelihoods. I want to thank all of you for encouraging, advising, alerting and criticising us where we have not done well. Your feedback has given us a sense of responsibility to do all we can to serve the public which is our client, better. Thank U for patiently bearing the inconveniences that have oftentimes come as we execute projects to improve Kampala. As the KCCA Team Leader, I have done my absolute best to lead the team towards fulfilling the commitment I made when I accepted the assignment to transform Kampala.